A compass can help you navigate the woods. When you plan a hiking or backpacking trip, a compass is a wise tool to pack. It can literally be a lifesaver if you get lost. 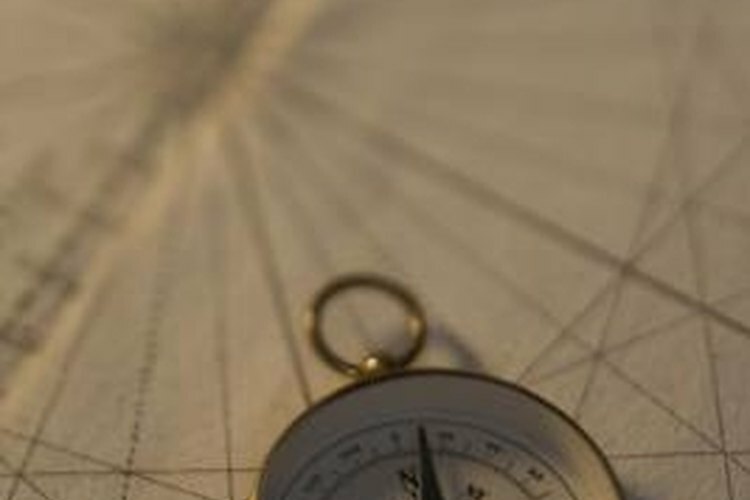 A compass tells you whether you are headed north, south, east or west. However, people may confuse the direction of north on a compass. The north direction on a compass actually points to the magnetic north that is in northern Canada. The north direction on a compass does not refer to the North Pole at the top of earth. The lensatic compass, or engineer's compass, is a type of navigational device. The main components of lensatic compasses are the base, cover and lens. The cover shields a floating dial. This type of compass has two luminous sighting slots, a sighting wire and dots for night navigating. The body of the compass contains the floating dial and an arrow that can point to north, south, east and west. You read the compass through the lens. The lens holds the rear-sight slot, which works with the front-sight slot. In addition, the rear-sight locks and secures the dial when the device closes. Some people may refer to a pocket compass as a needle compass. A pocket compass has a magnetic needle suspended over a card divided into 360 equal degrees. The needle identifies the cardinal compass points at 0 degrees, 90 degrees, 180 degrees and 270 degrees to denote north, east, south and west. In addition, a small arrow denotes the intercardinal points northeast, southeast, southwest and northwest. As you pivot the compass, the needle points to the direction. A prismatic compass is handheld and includes a glass prism sighting system. The top has a line that aligns objects for sighting. In addition, the compass card turns in the base. You read the compass card when it stops through the glass prism. An orienteering compass is also called a baseplate compass. This type of compass has been around since the 1930s and has a see-through plastic face and base plate. The compass includes a rectangle base and a 360-degree dial with a magnetic suspended needle inside clear liquid. As the dial turns, you read the direction. A thumb compass is a base plate compass that you control with one hand. You wrap the compass around your thumb. This allows you to hold a paper map and the compass with one hand and in one spot. This type of compass is frequently used for regaining and orienteering. What Are the Different Types of Compasses?